A council's £1bn agreement with a Chinese firm has been criticised as "a candy floss deal" by a former leader. Lord Scriven claimed public money had been wasted "chasing false promises" and accused two Sheffield councillors of acting like "Del Boys". The city signed a 60-year agreement in 2016 with the Sichuan Guodong Group. The Labour-run council said there had been "benefits and achievements" for Sheffield from the deal and it would benefit "for years to come". Lord Scriven, who is a serving Liberal Democrat councillor, said: "It is clear council leader Julie Dore and cabinet member for business and investment Mazher Iqbal have become the Del Boys of economic development." According to the Local Democracy Reporting Service, he added: "This is a candy floss deal. "When you touch it, it disintegrates into nothing and leaves you feeling rather sick...The only thing being spent is taxpayers' money." 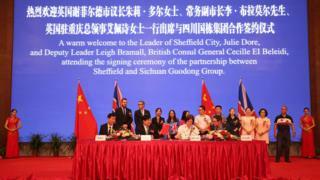 Speaking at the time of the signing of the deal in 2016, Labour leader Ms Dore described it as the biggest Chinese investment deal outside of London and "a massive vote of confidence in Sheffield". One of the first proposals was a plan to transform the city's central library into a five star hotel. However, work has not started on the project and the council has said it is "unlikely to go ahead". Edward Highfield, director of city growth at the council, said in a statement: "We have hosted a number of high-profile delegations from China and other countries. "This has been a well-established and supported economic development strategy which has increased the city's profile immeasurably on the global stage and promoted investment opportunities. "We believe that the city will experience benefits from our relationship with China for many years to come." The BBC has approached Ms Dore and Mr Iqbal for comment. Sheffield Central Library hotel plan "unlikely to go ahead"
Video What's behind the huge Chinese investment in Sheffield?